One of my inspirations for getting “into” fitness was watching my aunt decline way before her time. She was never a particularly active woman, and in her 60’s though that 50 pedals on a stationary bike was an adequate workout. Osteoporosis runs very severely on that side of my family, and ultimately, it’s what killed her. Her last several years were marked by a series of falls, fractures, and being confined to recliners and beds, and I maintain that she died way earlier than she needed to. I do not want to go out like that, and I’m guessing you don’t either. Genetics plays a really big role in how we age, it’s true. But there’s some proven ways that we can counteract our DNA and take back some power and some choice in what our later years might look like. If we want to remain active, we need to keep moving. Fifty pedals on a stationary bike, or a weekly walk through the grocery store simply won’t cut it. What do our bodies need? Muscle mass. As we age, and beginning in our 30’s, our percentage of lean tissue declines dramatically – 3%-5% every decade. Adding in muscular strength and endurance training can reverse that (and no, you won’t bulk up). If you have access to weights, great, use them. If not, try using things like cans of soup or full water bottles. Resistance tubing is inexpensive and easy to store. Frankly, just using your own body weight is awesome! You’ll want to include this kind of workout 2-3 times per week. Bone density. Again, this decreases beginning in our 30s! Especially if you’re at risk of developing osteoporosis, you need to keep impact in your exercise routine (unless your Dr has told you otherwise, of course). 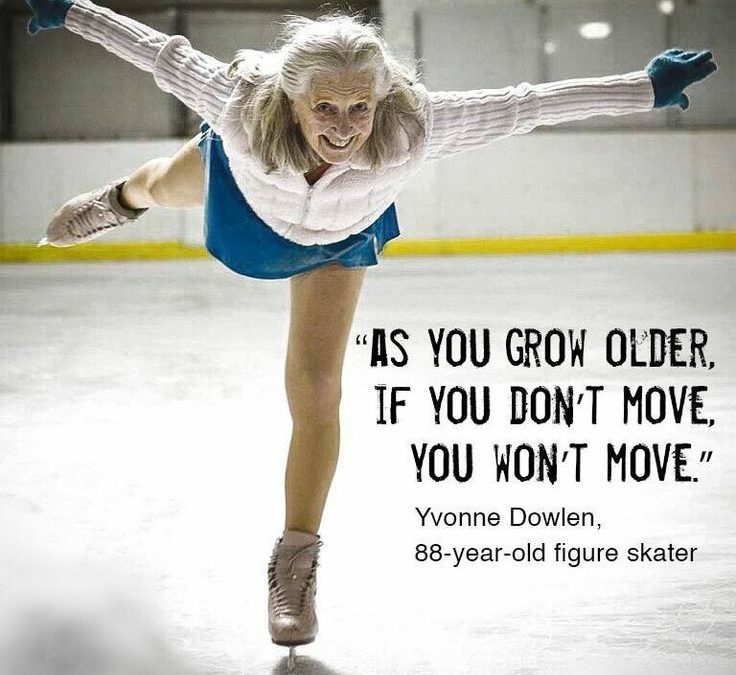 That doesn’t necessarily mean jumping all day long – even walking at a good clip or a dance class will do the trick. Aerobic capability. Good for your heart and lungs, elevating your heart rate and breath rate as often as possible will make all your activities of daily living easier. A stroll through the grocery store probably won’t do it, but walking with purpose TO the grocery store would. Learn something new – perhaps a language or craft. Do puzzles – word, number, jigsaw, your choice. Dancing has proven repeatedly to stimulate many areas of the brain, so come to Positive Groove or Zumba class, or pull up some videos on YouTube if you can’t leave the house. Every movement matters, so focus less on getting TO a workout a few times a week, and more on working movement INTO your daily life, hourly if possible. Choose to stand instead of sit, walk instead of drive. Yes, as a business owner I would love if you came to my studio to get, and stay, active. And absolutely, I have a solution for you no matter where you might be starting, or continuing from. But more important to me is that you keep moving, no matter where or how, as long as it keeps you happy, healthy, active and independent. Not just today, or next year, but 10 years, 25 years, 40 years from now. Last week I celebrated my 40th birthday. I would like to still be teaching classes (ok, maybe not as many) 40 years from now. This isn’t just a topic I’m writing about to fill a blog post for a week. This is something I’m passionate about and doing my best to live. Thanks for reading, and please, share your thoughts with me in the comments below.